Some people say “never judge a book by its cover.” But, almost everyone agrees that people will judge a book by its title. Great titles drive book sales. Lousy titles hinder book sales. A captivating title achieves several important marketing goals at the same time. It captures people’s attention, even when they’re distracted. It implies a promise of something good or interesting the reader will receive. It makes people feel cool or trendy to discuss the book among friends. Most importantly, it helps overcome skepticism and leads people to make a purchase. Book Title Question 1 – Is the title easy to remember a week later? Develop a title and then walk away for 7 days. If you can quickly remember the title after a week, you’re on the right track. Great titles allow our brains to embed the phrase in our memory for easy recall. Short titles that are punchy aid the memorizing process. That’s why one, two, or three-word titles can be so effective. Here are some great examples: Boundaries; Love Wise; Made to Crave; The Help. Book Title Question 2 – Does the title create immediate curiosity? A captivating title creates an automatic reaction within people to want to know more. Ideally, you want a title to make someone think, “I have to read that right now!” Notice how the following titles create natural curiosity: Safe People; 90 Minutes in Heaven; The World is Flat. Book Title Question 3 – Does the title imply value for the reader? A captivating title does more than just create curiosity. It implies a promise of something the reader will receive and answers the ultimate question, “What’s in it for me?” Effective examples include: Love Smart; What to Expect When You’re Expecting; The Power of a Positive No. Book Title Question 4 – Would readers feel cool if they tell someone else the title? People have egos and they like to be the first one to tell others about something cool. A captivating title enables readers to feel comfortable sharing word-of-mouth with others. You can see how all of the title examples used above pass this test. No one would feel embarrassed to be seen reading those books or discuss with friends. Book Title Question 5 – Does the title help build a brand? 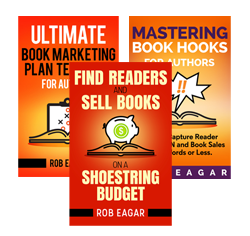 The best titles enable the author to launch a brand or continuing book series, such as spin-off products, speaking events, or a multi-book series for novelists (i.e. – trilogy). Some of the best examples include The 5 Love Languages; The Purpose-Driven Life; The Lord of the Rings; Harry Potter and the Sorcerer’s Stone. Each of the original books spawned numerous spin-off products and a long-lasting career for the author. 1. Assuming you’ve written a portion of your manuscript, go through your content and make a list of any sentence or phrase that is contrarian, counterintuitive, confrontational, or provocative. 2. Review your list and examine if any of those phrases spark ideas for a great title. Use alliteration, which is the occurrence of the same letter or sound at the beginning of adjacent or closely connected words.” For example, “Money Maker” or “The Secret to Changing Your Spouse.” Notice how using M and M or S and S give the title a smooth flow. Use these five questions and extra tips as a guide to create a captivating title. Doing so will help ensure people judge your book as the one they want to read next.